Shaftesbury Plantation Shutters from your local experts! 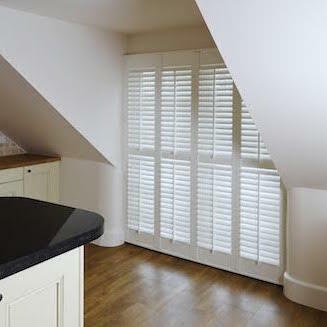 Just Shutters offers the finest range and broadest choice of bespoke internal shutters in Shaftesbury. All wrapped up in a perfect package complete with exceptional customer service and a lifetime guarantee. If you are looking for the ideal covering for your window or door, then look no further; shutters combine the luxury designer touch with a splendid array of more practical benefits. Your local specialist is Rob Cole (pictured). He is an expert with an eye for detail and thorough nature that creates beautiful shutter solutions for any home. Rob has been MD of your local Just Shutters for many years and has earned an unsurpassed reputation for quality and service. We would be delighted to demonstrate what we can do for your home, please call us today on 01722 440714 and let Just Shutters prove exactly why we have over 8000 satisfied customers, and show you why you should join them. Plantation shutters, sometimes called shutter blinds, are made to measure internal shutters that fit any size or shape window or door perfectly. This means that arched or round, bay or porthole (or any other shape or size you can imagine); shutters can achieve what other window coverings simply cannot – the PERFECT fit. Shutters can also be a great solution as wardrobe doors or room dividers. Most commonly they are known for their striking looks and practical benefits as window and door coverings. Please see our stunning shutter galleries for inspiration. Beautiful AND so practical! Shutters really do combine the fabulous designer touch with the functional efficiency you will delight in year after year. Shaftesbury’s most recommended shutter company, with thousands of satisfied customers and many hundreds of recommendations on checkatrade, we are the Wiltshire shutter specialists! Just Shutters are the fastest growing plantation shutter company in the UK. We have achieved this status though one thing alone – customer satisfaction! Providing the best shutters at a great price and treating houses like the homes they are, has enabled us to establish an outstanding reputation in the field. We value our customers and endeavour to provide the best products at the best prices! We invite anyone looking for shutters in Shaftesbury, Salisbury, Andover, Trowbridge, or the surrounding areas, to challenge us to show you why we ARE the overall experts – so call us today on 01722 440714. You may also like to visit our window shutters Bath page.